Netflix PH Page Now Up! Plan Starts At 370 Pesos And Goes With 1 Month Free Trial! 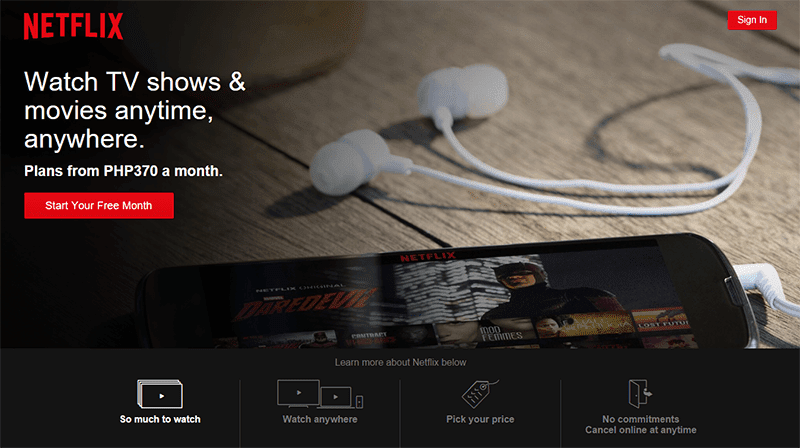 Home / netflix philippines / netflix philippines announced / netflix philippines rates / news / services / techstyle / Netflix PH Page Now Up! Plan Starts At 370 Pesos And Goes With 1 Month Free Trial! Great and BIG news everyone! Netflix just announced their widened global presence in a keynote at CES 2016. The highly popular Internet TV network is now in over 130 countries that luckily includes the Philippines! This only means that our countrymen can now enjoy TV shows and movies simultaneously with no more waiting on any internet ready device that includes your smartphone, tablet and PC. What's even more exciting with the announcement is the rates. The plan starts with a "Basic" bundle at 370 Pesos, where our local subscribers can now watch Netflix original series such as Daredevil, Sense 8, Jessica Jones and etc. They also have the "Standard" plan at 470 Pesos that allows two HD screens at a time and the "Premium Plan" at just 550 Pesos that gives you UHD quality and up to 4 HD quality screens. That's awesome as the plans are even better than some regular TV cables. The next challenge is getting a good internet connections that can let you stream with a lot of ease.